Hédène’s honey and black truffles preparation has subtle aromas thanks to the truffle’s scented flavor and acacia honey’s sweetness. Hédène's honey and black truffle preparation mixes the incredible sweetness of acacia honey and the powerful aromas of black truffle (tuber melanosporum). Refined and sweet, this truffle honey is 100% French. It is a delicately flavored dish, sweet and surprising, thanks to the truffle’s heaven scent. 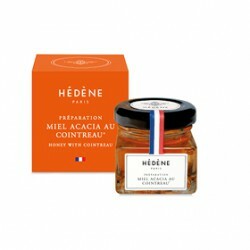 With its noble ingredients, this preparation is a genuine symbol of French soils’ know-how and a true gift for epicures. Harvested in France, with traditional beekeeping methods, acacia honey is very delicate and matches perfectly with the truffle’s refinement. Made with 3% of black truffle breakings, it can be tasted raw on toasts or with cheeses like brie or brillat-savarin. It also matches perfectly with exceptional dish such as foie gras or duck breast. Made exclusively from French soils, it is a true delight. Ingredients: French acacia honey 96%, black truffle breakings from Périgord 3%, natural flavor. Energy: 1272kj/304kcal; Fat: 0g of which saturated fatty acids: 0g; Carbohydrates: 82,4g of which sugars: 82,12g; Proteins: 0,3g; Salt: 0,01g.